“From the halls of Montezuma to the shores of Tripoli” is of course the start of the United States Marines Hymn. 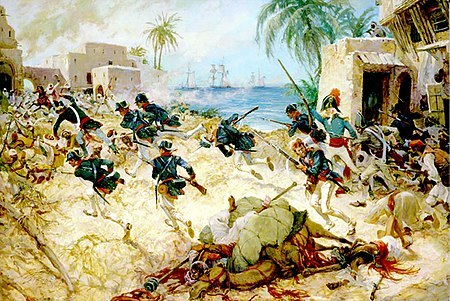 But what the Derne heck were the Marines doing win the first American victory on foreign soil in Tripoli on April 27 1805? Well, they were fighting Muslim “Barbary Coast Pirates” in the Mediterranean. These were not freebooters but agents of various North African countries, raiding ships, stealing their cargoes, and ransoming or enslaving their crews. They also raided European and even American towns, especially prizing women and children as captives, unless paid tribute to stay away. Very nasty. Incidentally while Jefferson was American ambassador to France he and John Adams, then ambassador to Britain, met with the ambassador from Tripoli and asked why they were raiding ships and villages. The reply was that Allah had ordered them to do so. Jefferson was prompted to read the Koran in response, and later when he was president and the Pasha of Tripoli demanded tribute from the United States, Jefferson instead sent the Navy and then the Marines. In the course of the resulting First Barbary War, a power struggle erupted in Tripoli between Pasha Hamet Karamanli and his brother Yusuf who had deposed him. The Americans thought Hamet was the rightful ruler, or a better one, or at least less trouble, and sent in the Marines to put him back in power. In the end they took the port city of Derne and forced Yusuf Karamanli to sue for peace. But Hamet never got back his throne. And after the Napoleonic Wars forced the Barbary states to give up piracy, the economy of Tripoli collapsed. Interestingly, Derna was taken by ISIL in October 2014 and then by the Shura Council of Mujahideen in June 2015. And in 2007 Jefferson’s Koran was used to swear in Keith Ellison, the first Muslim elected to Congress. What he thought of its history is not known. But we do seem to be in danger of coming full circle on the larger shores of Tripoli issue.